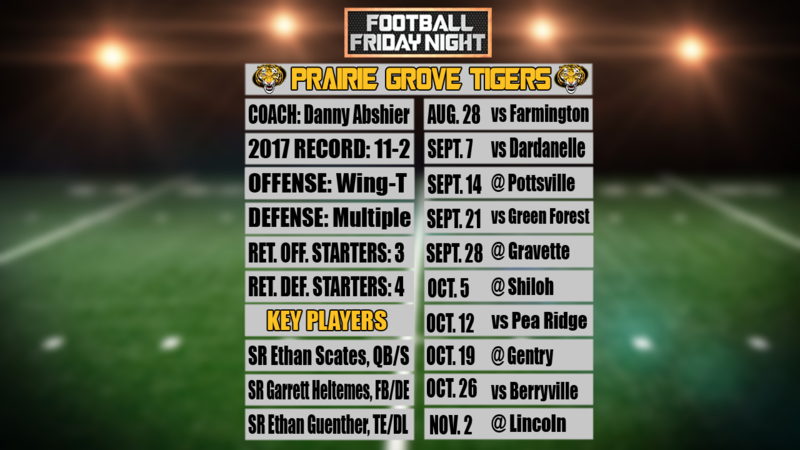 PRAIRIE GROVE (KFSM)--Danny Abshier has turned Prairie Grove into one of the most consistent 4A football programs in the state. And it hasn't been thanks to one quarterback. In fact, the Tigers are on their fourth in four seasons. "Just like any other position, you work him throughout the year when they’re younger and you keep working them throughout the summers and springs and you settle up with whoever’s gonna do it next," Abshier said. This fall, senior Ethan Scates mans the quarterback position. "It’s definitely motivating I’d say, cause you get to learn from the guy in front of you. Each new quarterback each year has a little something more to learn from," said Scates. "So I think it’s interesting to watch each quarterback ahead of you and learn from his strengths and capitalize on those." Scates is just the latest Tiger senior to run the offense, following in the footsteps of J.D. Elder, Zeke Laird & Sam Dodd. "We’re pretty comfortable with it cause all the quarterbacks we’ve had are pretty consistent and pretty good so I’ve never had a problem with switching quarterbacks every year," fullback Garrett Heltemes said. Couper Allen added, "The good thing about being in Prairie Grove is it’s kind of a small town so you kind of know the guys anyways. And I got to play with the other quarterbacks quite a bit in my sophomore season or freshman season." The Tigers and their Wing-T style of offense aim for a fourth straight conference title, and sixth in seven seasons. Prairie Grove opens up play on Tuesday August 28 against rival Farmington in the Battle of Highway 62.